Red Army tanks of World War II; not pretty or state of the art, but extremely effective nonetheless. This book is a history of not only the Soviet Tanks of World II, but also a history of tanks in the Soviet Union before and after the war. The book has a photograph or line drawing with specifications on each page. The story of Soviet tanks starts with the Russian Revolution, and continues into the Civil War between the Whites and Reds (among others of various shades also). The Soviets captured their first tanks, which were World War I surplus, from the various White forces. You are then shown how the Army and government were behind not only buying other countries' tanks, but also wanted to develop their own types and factories. Strangely, the Germans and Soviets collaborated for a few years from 1927 on. The Germans were not allowed tanks by the Versailles treaty. This cooperation between the two countries may seem strange to us today, with our knowledge of the history soon to be enacted between the two. At the time, it was a way for both armies and governments to work on tank development without any prying eyes. The next part of the book deals with the 'Deep Battle' Soviet concept. On the outside it pretty much seems like the first attempt by any army to develop what would later be called 'Blitzkrieg'. Two things happened to kill the idea and usage of "Deep Battle'. First was Stalin's purge of the Soviet Armed forces. Almost all of the officers who were involved with the creation of 'Deep Battle' or its usage were murdered or exiled to the Gulags. The second was the use of the Soviet tanks at that time in the Spanish civil war. Most European countries used this as a test bed for their different armaments. The general in charge of the Soviet expeditionary force came away with the idea that tanks were useless unless used in the infantry support role. This meant that both the Western Allies and the Soviets had reverted to a World War I usage of tanks, while the Germans who had little or no experience with their own tanks were free to work on their own ideas. The book then goes into all of the different Soviet light tanks and their usage. Next, the Soviet medium and fast tanks are showcased. The importance of the 'Christie' tank and the convoluted story of its arrival in the Soviet Union is gone over in detail. The 'Christie' tank was actually made by a U.S. manufacturer, but his design, while revolutionary, was not take to heart by the Western Allies at the time. The opposite was true of the Soviet Union, which is obvious by looking at their subsequent tank designs. The T-34 is gone over next in complete detail from inception to its last usage. As is befitting of such a design, it occupies a large part of the book all on its own. Heavy tanks are brought to our attention next. The various multi-turreted monsters of the various nations, along with the Soviets, are gone through. They all look quaint in a way, and they make you wonder what the different engineers and designers were thinking. The story of the SMK tank shows how well the writers have gone into their subjects. When Stalin was presented with the original clay model of the SMK, a fight of sorts broke out. Originally the SMK was to be a three turreted design. To cut to the chase, and end the bickering, Stalin snapped off one of the turrets saying "Why turn a tank into a department store?". The book also shows how deeply Stalin was involved from the beginning with tank development and construction. Strangely, the designers were able to have give and take dialogues with the fearsome dictator. 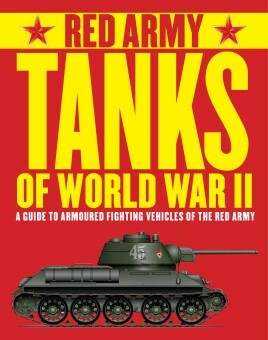 The book goes into all of the Heavy Soviet tanks, and also its tank destroyers. Among them are my favorites: the SU and ISU152. This monster was given the nickname 'zvierboy' or 'animal hunter' for its ability to take on German Tigers and Panthers. The lend lease American and British tanks are then shown, and likes and dislikes of the Soviet tankers to the different models are told. In 'Stalin's Legacy' we are shown the generations of tanks from WWII to the Cold War, and the resurgence of the 'Deep Battle' concept. An appendix follows that shows exactly how many tanks of what series were produced, and also gives some German versus Soviet tanks numbers in a few picked battles of the Eastern Front. This book is easy to recommend to anyone who is interested in not just Soviet tanks, but also in their history and development.